When travelling on German DB trains with a seat reservation, you usually get a car number and a seat number. Seat numbers are integers unique within each car. Typically, these seat numbers are distributed in a somewhat sequential manner from one end of the car to the other. However, I am saying somewhat because it has happened more than once to me that I missed a given seat at first. 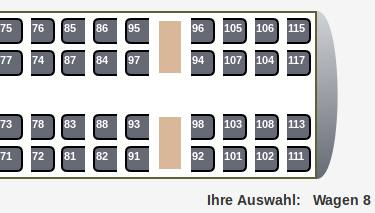 Within each row or pair of rows, seat numbers seem to be distributed according to a pattern that I do not quite understand yet. Now, when standing in the aisle in the middle of seats, that schema does not become quite as apparent (thus leading to some confusion when searching for one's seat, especially when subject to limited mobility due to luggage, children, or other passengers in the aisle). Is there anything to avoid about numbers ending in 9 or 0 so they do not appear based upon this schema? And anyway, I wonder whether there is any system behind distributing the numbers within such a block of eight seats. What is the reason or benefit behind this way of numbering seats? EDIT: While there seem to be a couple of numbering schemes, my impression is that at least "normal" IC and ICE trains feature the numbering as described above. Thus, I would like to exclude any additional numbering schemes from yet other train types from the focus of this question, although other special cases that I did not cover here and that do appear on IC or ICE trains (e.g. unaligned tables, maybe) are still within scope of the question. The numbering scheme is based on historical international standards. Those were originally developed for compartment coaches, which is why always two rows are considered together (one compartment had two rows of opposing seats). The numbers aren’t consecutive because the first digit is the “compartment number”, independent of the place number in each compartment (last digit). When the system was conceived, compartments usually had six seats. It was defined that seats 5 and 6 are at the window; in order to keep that consistent for eight-seat “compartments”, the additional seats 7 and 8 had to be inserted in the middle. This clever seat number system, dating from the pre-computer era, was an easy way to maintain an even distribution of passengers over the train, when the train was not yet fully booked. Passengers would get annoyed if the distribution was carelessly uneven. Initially the seats x1, x2, x5, x6 were assigned by the booking system, and all passengers had some free space at their side. When all x1-2-5-6 seats were full, the x3 seats were assigned. Next the x4 seats, then x7, and finally x8. The system worked fine for trains containing combinations of 8 and 6 seat groups, 8 and 6 seat compartments, and 6 or 4 sleeper compartments. This numbering system was used for long-distance trains and international trains in Europe, and it was part of the Regolamento Internazionale delle Carrozze (RIC), an international railway agreement that facilitated the cross border use of cars.